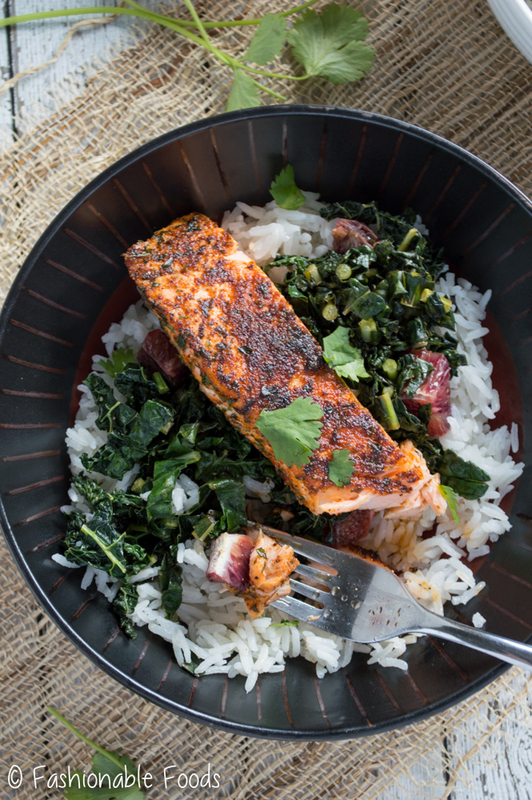 Salmon filets are dredged in a flavorful spice mixture, cooked to perfection and served over sautéed kale and blood oranges. 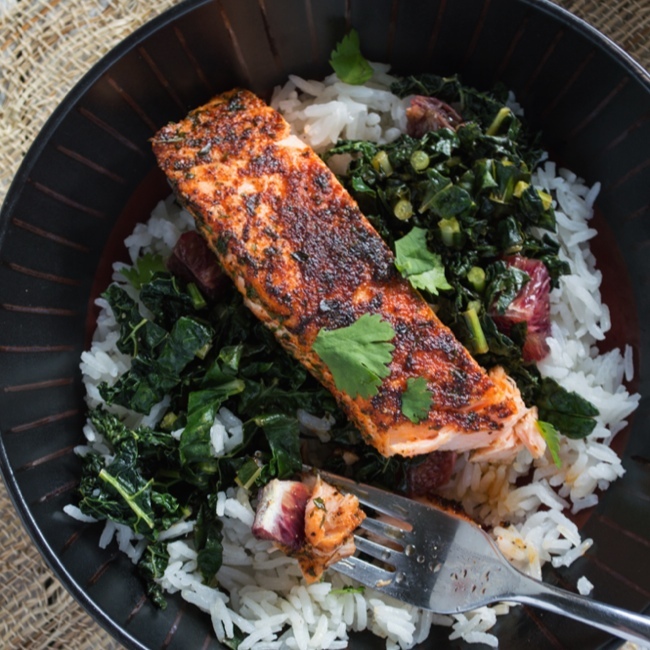 These blackened salmon and kale bowls are the perfect healthy dinner – serve over quinoa, rice, or cauliflower rice for Paleo & Whole30! Happy Thursday friends! Can you believe it’s March already? I’m pretty excited to spring arrive, but not until after we get some snow tomorrow. ? There’s a definite light at the end of the tunnel, though – temperatures in the 70s are possible next week! Ok, enough weather talk, let’s talk about my cat. My cat, Basil, is like a small child. She wakes up every couple hours at night, requires frequent feedings, and cries when she wants me to hold her. Yes this is a cat and not a child. Basil is very attached to me. While I was away last week she only had Kyle to keep her company, which made her very unhappy. Every night I was gone she had him up constantly knocking stuff over and crying. When I came home, she ran to me and didn’t leave my side for a few days. Kyle was happy, too. He told me not go away again because she’s too much to handle. ? 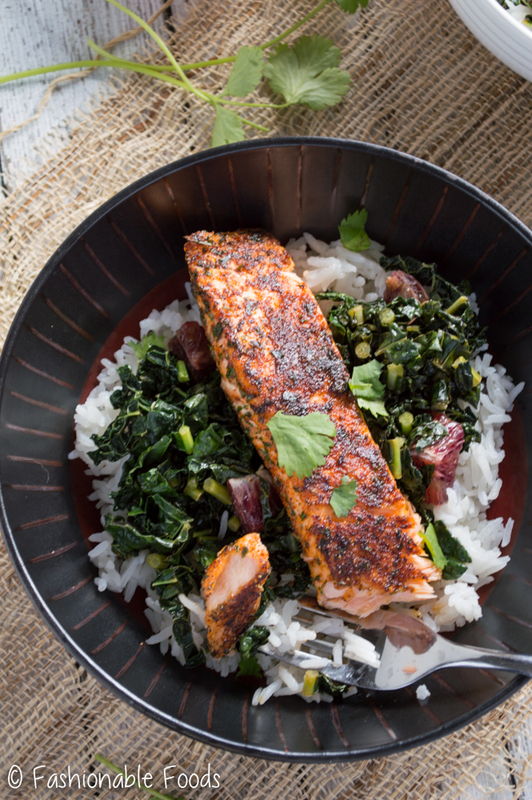 Ok, now let’s talk about these blackened salmon and kale bowls. My original intention for these were blackened salmon, kale, and quinoa bowls. I started cooking and went to reach for the quinoa and realized I was out. I then thought about making cauliflower rice, but I didn’t have any cauliflower. So I ended up using rice. You can use whatever floats your boat, though. I think both quinoa or cauliflower rice would be delish! This meal was one that Kyle was completely unenthused about. Pretty much anything with kale makes him wrinkle his nose. However, once he tasted it, he was very pleasantly surprised! The salmon has SO much flavor from the spice mixture and it pairs so perfectly with the sautéed kale. I start by cooking the salmon in a skillet, then transferring it to a plate while I do the kale in the same pan. That’s the trick to adding a ton of flavor to the kale – it picks up all the flavor from the residual spices. I add in a little blood orange juice, white balsamic, and a cut up blood orange. 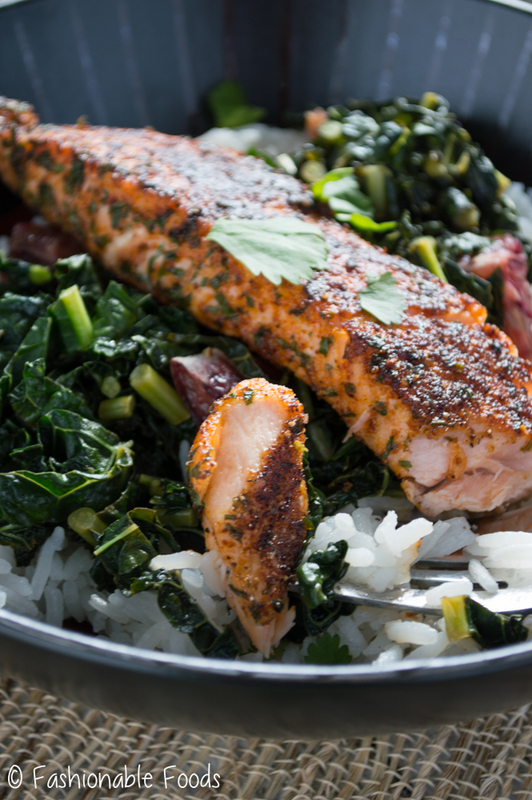 The tangy-sweet kale balances out the robust flavor of the salmon. I would be perfectly happy eating this a few times a week, it’s that good! 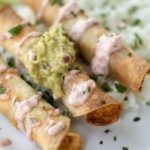 If you’re doing a round of Whole30 or follow a Paleo diet, this recipe is compliant with both as long as you serve it over cauliflower rice. Or, you could simply just have the salmon over the kale. Or, you could add other veggies. You see where I’m going with this? 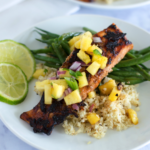 If you’re not into salmon, you could simply use another fish or even use chicken. Anything goes here! Also, while the spice mixture is full of flavor, it isn’t overly spicy. It has a small amount of heat from the added cayenne, but you can certainly leave that out if you don’t want any heat. These bowls come together really fast, too! Perfect for weeknight cooking. ? In a small bowl, combine the spices. Dredge the salmon filets in the spice mixture, pressing to pack it on and being sure to coat the sides. Heat half a tablespoon of the olive oil in a skillet until very hot. Add the salmon filets and cook 3-5 minutes per side, or until the fish is just cooked through and flaky. Transfer the salmon to a plate and set aside. Heat the remaining olive oil in the same pan and add in the kale. Season the kale lightly with salt and pepper and stir it around the pan until it begins to wilt. Add in the vinegar and the blood orange and stir to combine. To assemble your bowls: add your preferred base in the bottom of the bowl (rice, quinoa, cauliflower rice); top it with a generous portion of kale and then top with a filet of salmon. Enjoy! I’m a firm believer that animals are like children, they are our fur children. Sounds like your kitteh is a handful, but super loving! Swoon! 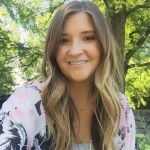 Love these bowls, Keri! Blackened salmon, kale and blood oranges?! OMG, Give me a vat of this ASAP! So much deliciousness going on! Cheers, doll! They totally are! 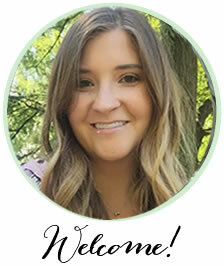 Thanks for the salmon bowl love, Cheyanne! Aw, I bet Basil is glad you’re home! Sounds like she loves her mama! 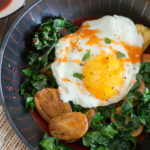 These salmon kale bowls sound delicious! I love that you added blood orange. 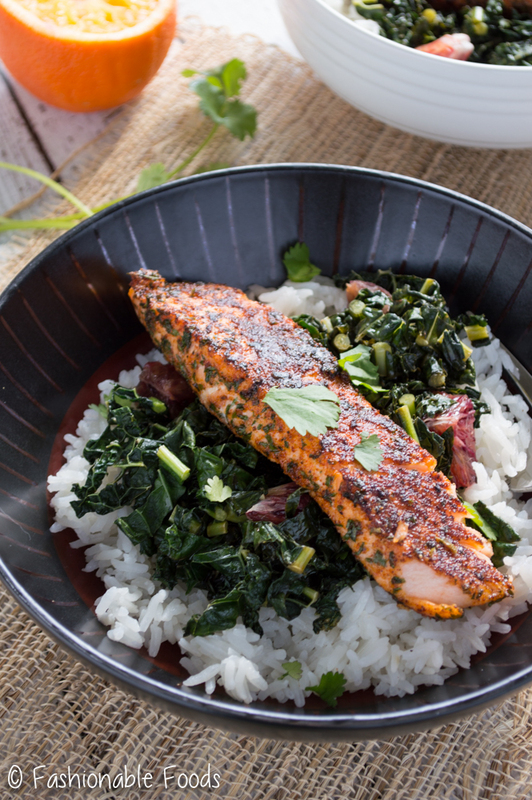 Salmon and Kale bowl looks absolutely delish! I’m currently experiencing “personal summers”, I’ve heard foods with high alkaline levels are helpful; I believe kale is high in alkaline. I will let you know what I think.